Info "Catch falling rings on your finger! Next time, I gotta make this game with doughnuts..."
I'm #1! is a microgame found in the Total Drag stage in WarioWare: Touched! 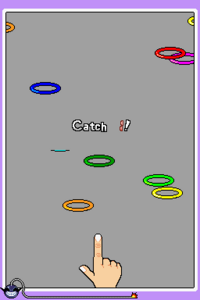 The objective of the game is to drag the hand on the bottom screen, trying to catch the falling rings with the flexed finger. In later levels, harmful obstacles also fall from the top screen, which must be avoided. 1st level difficulty: The player must catch one ring with no obstacles. 2nd level difficulty: The player must catch two rings with few obstacles in the way. 3rd level difficulty: The player must catch three rings with obstacles in the way. This page was last edited on April 6, 2018, at 10:51.